A few weeks ago we celebrated Beaujolais Nouveau Day, marking the bounty of the fall harvest. Well, fall has fallen and winter has arrived. In fact, DC is expecting 3-6 inches of snow tomorrow! 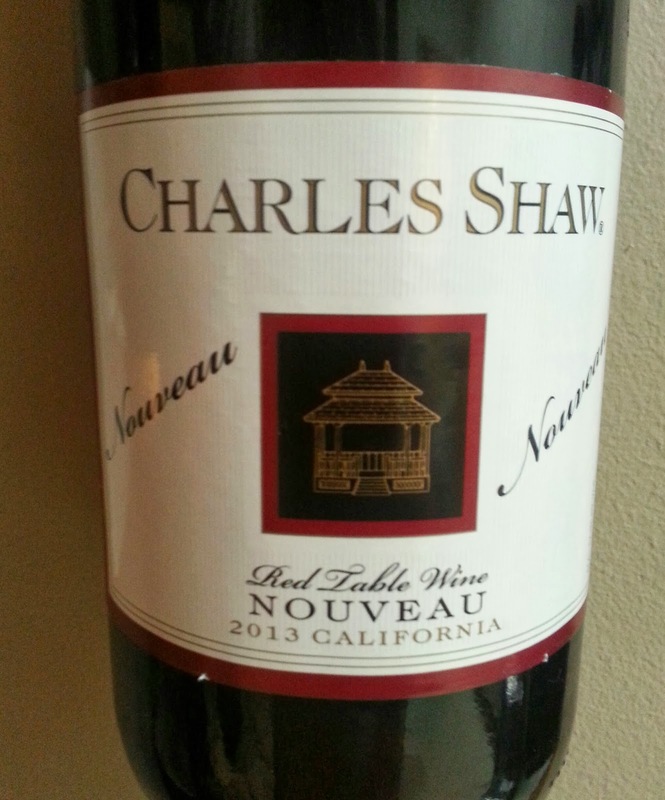 Here is the last vestige of fall -- Trader Joe's Charles Shaw "Nouveau". It's the two-buck-Chuck version of a Beaujolais Nouveau. However, it's clearly not from France, and, at least in my neck of the woods, is $3.79-Chuck. This wine is classified as a California Red Table Wine. There's no telling what's in it, but I expect there's a bit Gamay and then a bunch of something else (very specific, I know). The Charles Shaw method is to source grapes from multiple places within California, based on what is readily available and priced to move. That's why their wines can have a great deal of vintage (and within vintage) variation. Review: The nose on the Nouveau is a bit bland, not giving off many aromas. On the palate the wine is a bit off dry with some sweet red raspberry and mandarin orange notes. Light and simple -- there's not much to say. Food Pairing: Fruit -- as in cut up some fruit and add it to the wine, along with a bit of Brandy. This would be a decent base for a fun party sangria. Bottom Line: This wine is exactly what it is supposed to be -- light, easy, and unoffensive. It doesn't stand up to the real deal Beaujolais Nouveau, but at less than half the price it's not a bad substitute. Did I love it? No. But did I hate it? No. i picked up a case today, accidently . It was on and end-cap of chardonay, which i intended to buy. Yes, i know im a Jibrony, but when i got home and realized my mistake, i opened a bottle, to check it out,,, yum, i''m keeping it, you can't get wine like this for 2.49 a bottle, chuck rocks. Hi Richard. I'm glad you enjoyed the Nouveau. It's super light and easy. And like you said, you can't beat the price! Wine snobs maybturn their noses up but I look forward to this wine. Its very smooth.